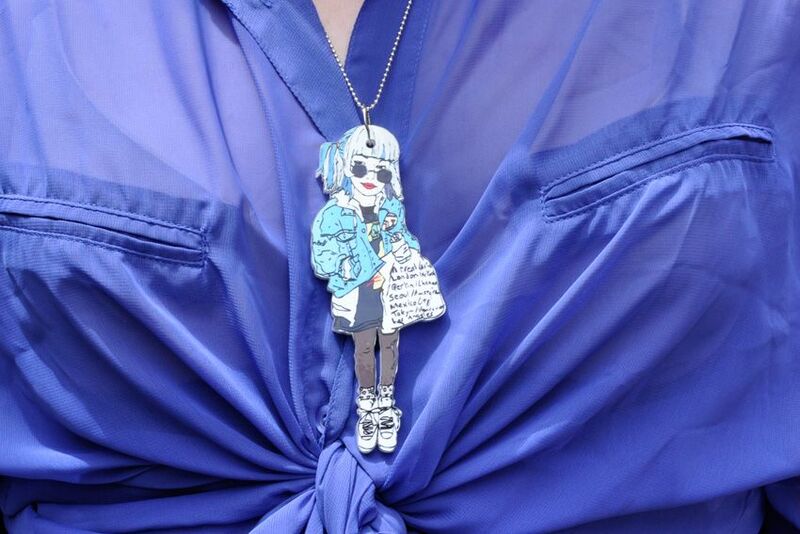 I recently blogged an outfit photo of me wearing this Tokyo street style illustration necklace by my friend Brandon of Lactose Intoler-Art, but without a close up detail shot of it or much in the way of explanation. So without further adieu here goes. I have never met Brandon in person but we both have a mutual love of Tokyo and share the same friends in that city. We just never seem to be in Tokyo at the same time, hopefully that will change next year with me planning a three month stint for some work and fun (!). 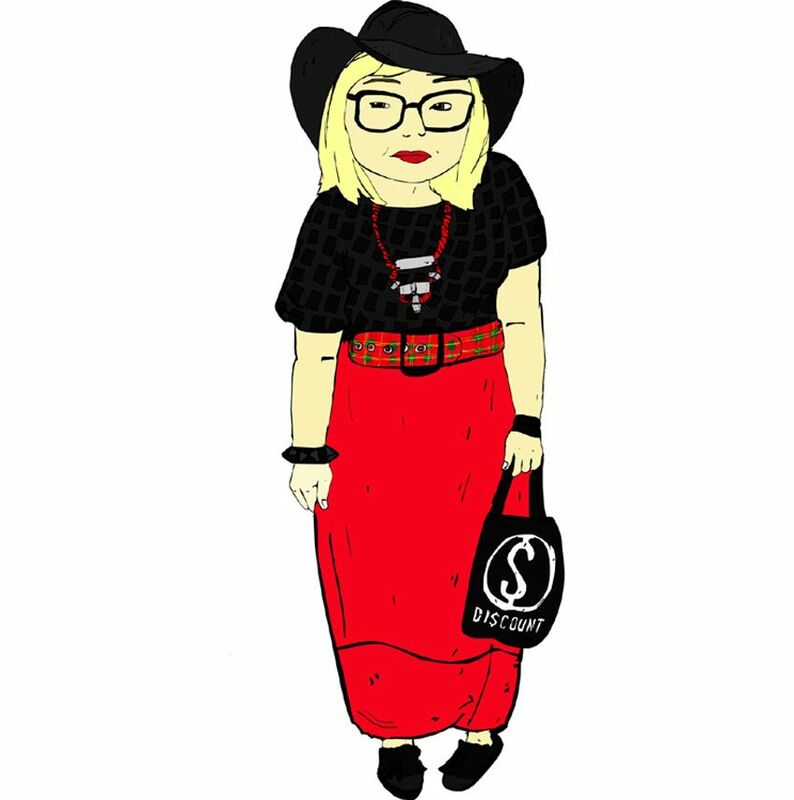 I've been a fan of Brandon's work for a long time, first blogging about him back in 2008, and again when he drew me in 2009 and more recently as part of my Sunglass Hut Inner Circle inspiration posts. What I love about his illustrations is that they perfectly capture the unique fashion and style of Tokyo but you also get a sense of the subjects personality too. Brandon now has his own online store where he sells necklaces and tote bags featuring his Lactose Intoler-Art illustrations. If you don't see one of your favourite illustrations or street style shots in the store he can do custom orders too, they cost a little more but are worth it to get something unique to you. I really wanted a girl wearing platform sneakers so he sent me this design of the girl with the blue hair which I love. The amazing thing is people on the streets of Harajuku have been wearing his necklaces and bags recently too which you can see on his blog here. How amazing is that, he is now contributing to the outfits and fashion in Tokyo that he loves so much? I told you I had more colours in these My Italian Closet socks! Here I am wearing the pale blue pair. Brandon surprised me with this updated drawing of me and I love it. 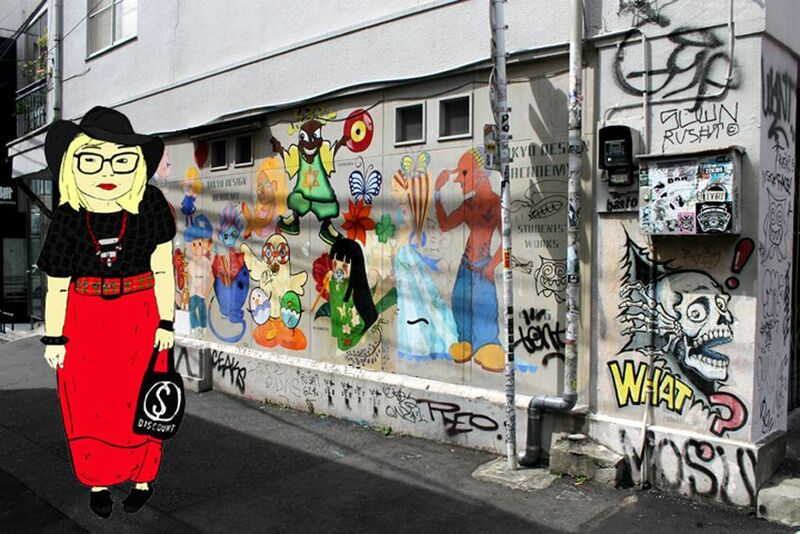 I especially love that he also sent me it as a photoillustration of me in Tokyo. Can't wait till I'm over there again!!! Great outfit, that colour really suits you. Great outfit, that blue really suits you. Thanks so much for the great feature of my art Hayley! Yea, it is weird that we have been friends online for so long, and also have met a lot of the same friends in Tokyo and other parts of the world, but haven't actually crossed paths yet. I have a good feeling we'll meet in Tokyo fairly soon. Thanks again! His illustrations are really great, I checked out his site. Awesome stuff. Aah, you're going to Tokyo again? So cool! I really want to go there one day. Tokyo is one of my dream cities. I freaking love those socks. I keep checking out the ebay seller but they all seem to be for children. Which is a shame, because some of the tights are soo nice. Found your blog. Found I like it! honestly- that illustration is just so rad. Love the way you wear that ASOS blouse. you kill it! Love the socks and sandals, it may be unfashionable to some, but I prefer it to wearing heaps of bandaids due to blisters! Hi! I'm a new Melbourne-based blogger. Love this post! Especially love the blue blouse! What a lovely thing for your friend in Tokyo to do-to create a character of yourself! So sweet. It must have been amazing when you were living in Tokyo.